The officers who killed Freddie Gray have finally been formally charged with murder and manslaughter. Three of the six officers are African-American. The most serious charges have been leveled against Caesar Goodson. He too is African-American. The White Right, Fox News, and other Right-wing propaganda outlets are obsessing over the fact that three of the Baltimore police who have been charged with killing Freddie Gray are African-American. This obsession is part of the same paraphilia that has the White Right deflecting the role that racism and classism played in the killing of Freddie Gray because Baltimore is a city whose political leaders are African-American. Because of how the White Right and movement conservatives are simplistic binary thinkers who live in an alternate reality where white people are victims of "racism", global warming is not real, Obama is a "Socialist", cutting taxes for the rich produces economic growth for the rest of society, Christians are "under siege" in America, and other conspiranoid delusions, they possess a pronounced inability to understand nuance or context. Thus, movement conservatives and the White Right, to the degree they can be separated from one another, are unable to practice systems level thinking and analysis: concepts such as "institutional power" are lost on them. Individuals navigate their relationship(s) with systems of power. Cultural institutions such as the police have a set of rules and norms that govern how they socialize their members. Those learned values influence how the police relate to those outside of their subculture. The United States is a racist society. By implication, its dominant political, social, economic, and other cultural institutions will to varying degrees reflect those norms. The origins of America's police are found in the slave patrol. America's police have continued in that tradition by acting as agents of social control who harass and discriminate against black and brown Americans. African-Americans and other people of color who join America's police departments are not immune or outside of that subculture's norms and values. Because they are the Other in a socio-cultural institution that has historically worked to oppress non-whites (and the poor, as well as the outgroup, more generally) black cops may actually have to perform those roles in a more exaggerated and gross way in order to prove their bonafides. If White Supremacy and Whiteness were a religion or a cult (and they do share some of those traits) black American cops would most likely be the new converts, the overzealous, the great true believers, the most devout who are desperate to show their allegiance to the faith. Human history is replete with examples of how members of an oppressed or marginalized group laid down with Power for personal gain, to make life easier for themselves, or other selfish reasons. The difference between the overseer and the DRIVER was simple: drivers were slaves themselves. A driver might be convinced by a master to manage the slaves for better privileges. Drivers were usually hated by the rest of the slaves. These feelings often led to violence. The position of a slave driver was very rare. Slave drivers were enslaved black men that directed the daily work of the slaves. They held the responsibility of overseeing the work of their fellow slaves as well as enforcing punishments for misbehaving. It is estimated that only 1 in 260 slaves was a driver. Plantations with fewer than 100 slaves rarely ever had a slave driver. Drivers were another story. They were slaves appointed by masters to positions of authority on the plantation. Where masters were resident, black drivers often replaced overseers. On larger plantations, especially in the Lower South, black drivers worked under the supervision of white overseers. The drivers' jobs were manifold, but they were expected above all to maintain discipline in the fields and order in the quarters. Like overseers, drivers were subjected to competing pressures that demanded both technical skill and a strong measure of self-confidence. But the pressures on drivers were different in important ways. Drivers were a part of the slave community, but they were especially favored by the master. To maintain the goodwill of the master without losing the respect of one's fellow slaves was no small achievement. Yet the evidence suggests that the drivers often succeeded where the overseers failed. They were chosen for their intelligence and abilities; they often understood how to manage a plantation more effectively than the overseers. Accordingly, drivers often held their positions for decades. The masters came to rely on the drivers for their competence; the slaves came to expect the drivers to moderate some of the harshness of the regime. Black slave drivers could also have a great amount of power over a given plantation. Some white plantation owners would even allow their black drivers to manage and run the day-to-day operation of the plantation in their absence. Because black drivers existed in a type of liminal space between the white masters and their fellow slaves, many black drivers could be especially violent and cruel--even by the standards of the horrific slave plantation labor system--in the conduct of their duties. Cocke would eventual relieve Skipwith of his responsibilities as a slave driver because of the latter's "radical depravity", selling Skipwith and his family "down the river" to Mississippi. The reaction by the White Right and their media to the killing of Freddie Gray by three black police officers has provided an interesting insight into their political worldview and cognitive schema. Racism and conservatism are merged in the Age of Obama and the post civil rights era. Thus, anti-black animus colors the political decision-making and thinking of movement conservatives. Will hostility to black people more generally trump their loyalty and authoritarian predisposition to police and police authority? Or will anti-black animus be focused on Freddie Gray and the black young people who participated in the Baltimore uprising because White America's fantasies and fixation on "race riots" and "black crime" have such a powerful hold on the White racial imagination? 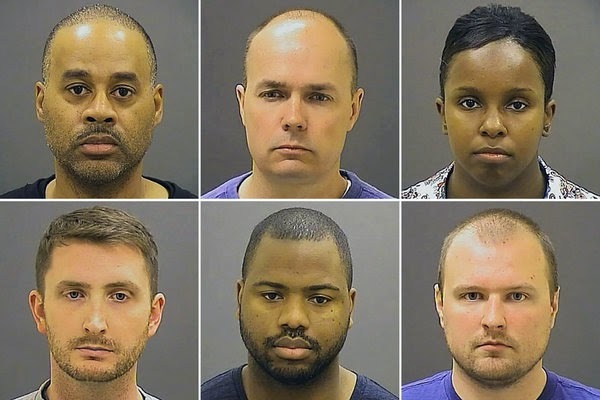 Consequently, the black cops who killed Freddie Gray will be valorized alongside their white thug compatriots by the White Right and Republicans because this freakish interracial union of police violence is somehow "proof" for white conservatives (and other colorblind racists) that white supremacy no longer exists in the post civil rights era. America's much discussed and tired "national conversation" on race has been conducted at a first grade level for most of the post civil rights era. There is still some hope--however weak--that the election (twice) of Barack Obama, changing demographics, globalization, and the interracial coalition of young people who are mobilizing against police thuggery and the Culture of Cruelty, will elevate America's moribund and tedious "national conversation" on race to the third or fourth grade level. Movement conservatives and the White Right are still stuck in remedial classes on matters of justice, the colorline, and the Common Good: if American conservatives do not improve their performance they will be flunked out of school and sent to find other means of educating themselves. Generational replacement offers some hope for progress. Unfortunately, that solution is also proving to be a tenuous one. Marquez Claxton, a former police office and Director of Black Law Enforcement Alliance also indicated in an interview that diversity wasn't the only answer to rogue police behaviors. He cited that the "blue culture" socializes them in a manner that they either engage in bullyism or remain silent for fear of losing their jobs or lives when they need backup. As you say....."Individuals navigate their relationship(s) with systems of power. influence how the police relate to those outside of their subculture. " BTW: There might be some hope for Baltimore personified by State Attorney Marilyn Mosby, to put a dent in that 'blue wall' or as I'm hoping, knock it down; for she's shown exceptional courage in phase one. Conservatism as propaganda appeals to the ignorant who may be amenable to remedial education. But conservatism as ideology is for the Machiavellianly intelligent who are intransigent. Recognizing the necessity of "slave drivers" and their role in perpetuating the Culture of Cruelty, conservative and liberal ideologues have invoked the "few bad apples defense" to explain the alleged culpability of the 3 suspect cops. We gotta be up for educating the ignorant and rehabilitating the sophisticated in the knowledge that the one follows the other. The "low information" faction of white right/movement conservatives have little if any interest or understanding beyond maintaining white supremacy for their own gain. Others who have a higher level of intellectual ability than that group, like the talking heads on Fox for example who pretend white supremacy doesn't exist, do so only to keep it in place, as they do understand the benefits. Similar to the strategy and benefits they derive from the fiction that is "the liberal media." Black cops tend to be cops first. The so called "blue wall" demands their allegiance, even to the point of law breaking. The black cop in the Walter Scott case apparently didn't give a second thought to lying to cover up the truth of what his colleague had done. Their oath is to "uphold the law," and yet what this says is, their real loyalty is less about the law, than it is towards this system of institutional abuse. One would think that, a black cop, having come up as a member of an oppressed group, would have more integrity regarding doing the right thing. And this is not to say that all black cops, or all cops for that matter, or as morally compromised. But the pressures of the system demand that they be. Some time ago while still in college, driving home for the holiday break, we were stopped going through a small town for "going too slow." The white cop was calm, took the driver into the police station. The black cop on the other hand, went over the top, called the rest of us waiting in the car, niggers, going through every stereotype there was, threatened our lives in the process and acted out so outrageously as if to prove to his white hosts that he was "good." It was a terrifying experience, because we got the sense that there was nothing this "brother" wouldn't do, in a sick attempt to show he was one of them. This was "the blue wall" but it was also "the slave driver" in action. The idea that because three of the cops were black has to mean that this was yet another "isolated incident" that had nothing to do with class or the long line of unarmed black men who are killed every 28 hours is as ludicrous as saying because blacks were slave drivers that slavery had nothing to do with race. Its not about the race of those doing the oppressing as it is about the race of the victims. And yet, this is the absurd BS they push on the public. Some actually believe that, because there is now a president who happens to be black, then therefore racism no longer exists and the continued racism blacks face is either based on lies they're telling, just because, or because black folk are somehow too stupid to understand what's happening to them. What's happening in Baltimore is beginning to put the lie to all that. The "talking heads" on corporate news channels are actors with no real political values to speak of. It would be a tactical mistake to think that even the most strident "sounding" racists among the elite newsreaders are writing their own material and really spewing their own vile racist thoughts. The reality is that the news-actors are dancing to the directives of their ownership whose political (POWER) agenda is voiced through their news divisions which are a small but powerful propaganda wing of much larger and diverse corporations. In the end, the networks decide what America thinks and all citizens are subjected to daily corporate propaganda. Citizens United is the perfect example of how the working class allowed corporate greed to undermine freedom in the name of a form of twisted "free speech" that deems money to count as a multiplier of individual speech. Within that context, white racists are undermining their freedom today in the same way they did during Reconstruction. "In 2013 Rice was ordered by a judge to stay away from his ex-girlfriend’s husband after reportedly threatening him." I read a pretty good piece from the Atlantic yesterday about right wing observations on Baltimore and race in general. The writer was way too gracious, but was very observant about different conservative publications. Strangely, while the right explains away institutional racism with appeals to family values and black dysfunction they also feel a need to share memes about "not all blacks are criminals, not all cops are bad, and not all whites are racist." Its almost like an incantation or a mantra. They just keep saying the same bs over and over hoping it continues to insulate them from Other America. Great article, especially on the remedial level of the "race conversation" in this country. I do want to ask about your qualifying conservatism as racist in the Age of Obama and post civil rights.era. At its core, conservatism is about making little to no change to the establishment. Even conservative resistance to police and police authority are manifestations of resistance to the idea that there's a higher authority which can challenge conservatives' abuses of minority populations, a la the Civil War. Wouldn't it be accurate to say that conservatism promotes inequality in any society that is unequal; conservatism promotes racism in any society that is racist? How many times do we hear minority cops deflect from police abuse by demanding minority communities instead focus of some perceived problem within them, as if those minority officers are not part of the same community? as a result of the changes put in place by former mayor/now governor, the police have become an occupation force in line with apartheid South Africa or occupied West Bank (Palestine). Iow (my 'translation'), they've lost legitimacy. Zactly. Conservatism in an egalitarian society would promote equality, equality that excludes racism. Inequality and racism are correlates peculiar to our epoch. Yet when it comes to the Holocaust, conservatives will rightfully condemn the Nazis as one of the most wicked governments in history, despite the fact that there were Jewish collaborators throughout Europe.Are they going seriously argue that the SS wasn't enforcing Antisemitic policies because there were Jewish overseers within the concentration camps? On point, article. I agree, they are the equivalent of slave drivers of slavery times. And as you point out, sadly products of the society this country has built. Willingness to sacrifice parts of your character, at the expense of others, is rewarded. Brilliant analysis! Sorry about your incident with the police. Reminded me of my favorite recent dystopia, "In Time" even though there was a dearth of ethnically diverse characters. See it if you get a chance if you haven't already. Re: "Its not about the race of those doing the oppressing as it is about the race of the victims." Ah ha! That pretty much sums it all up. Nicely said. P. S. Note that only the van driver, who was black, was charged with murder. The other five, three white and two black, were charged with lesser crimes. It's a lot easier to punish the slave driver rather than the slave owner(s). P. P. S. Speaking of slaver drivers, Dr. Ben Carson has just thrown hit hat into the ring. Good article. A couple of things Simon said pissed me off but still a good article. A one line summary (my speciality): The war on drugs turned inner cities into police states. Conservatism has always been about conserving unequal societies against, I would say mostly, progressive forces. Granted US conservatives are righties. But conservatism is the conservation of the dominant ideology. That ideology could be capitalistic at one extreme or socialistic at the other. A conservative in a socialist society would be one who adheres to egalitarian values. Yes, conservatives are right wingers for all intents and purposes but it nice to entertain the thought of a socialist conservative, a conserver of socialism. "Note that only the van driver, who was black, was charged with murder." Indeed, and I always believed that the first cop to receive justice for fatal misconduct would be black, of course. Also, if the mayor, DA, police chief etc were white, would any of this "justice" be happening? BTW, Carson is off the chain crazy. He's going to make Herman Cain look Thurgood Marshall.